Eat. Live. Laugh. and sometimes shop! : Color me impressed! For the first year my kids were able to hold a crayon I withheld all mass-marketed coloring books. I wanted them to scribble and have fun. I didn't want them constrained by pictures of mass-marketed characters. Of course, that lofty ideal promptly came to an end when Olivia saw a princess coloring book in the check-out aisle at the grocery store. Imagine the world from her eyes: blank white paper or a book filled with princesses. How could I say no?! I still encourage creativity but have shelves filled with mass-marketed nonsense. 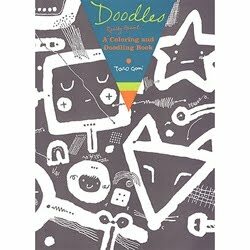 Doodles, by children’s book illustrator Taro Gomi, encourages children of all ages not only to color and draw, but also to be imaginative and creative. Doodles is filled with “unfinished’ pictures and intriguing prompts designed to foster children's power of visualization. Doodles’ 400 pages provide plenty of room to stretch the imagination! Taro Gomi lives in Japan and has illustrated more than 100 books for children. $19.99 (with free shipping) at Arango. A similar book, Scribbles: a Really Giant Drawing and Coloring Book, also by Taro Gomi is available at Anthropologie. What a great birthday gift to stash in your gift closet!